AT&T (s t) has raised prices on wireline phone users in California, which has consumer advocates crying foul,. The rate hikes aren’t just being driven by greed on the part of Ma Bell, but by the more rapid disintegration of the wireline business, as customers abandon ship while providers are stuck maintaining a network for fewer customers who often pay less. The solution to this is to get Americans off the old copper networks, a goal of providers and the Federal Communications Commission. But between now and 2018, when an advisory council to the FCC hopes to kill off wireline service, AT&T still has assets to sweat and employees to pay, which means the laggards keeping their landlines will see the cost of their phone service rise. Beginning March 1, AT&T is boosting the cost of basic phone service for Californians who buy a calling plan that allows a limited number of local calls for a flat fee by $3 a month to $15.37 a month. As David Lazarus, the consumer reporter at the Los Angeles Times notes, that’s almost a 25-percent increase. The charge for additional local calls will be 3 cents per minute. About 10 percent of California consumers have this type of plan. But AT&T’s costs of supporting those landline subscribers is rising. The network in areas is decades-old. Keeping it running costs a lot in labour for what is a relatively modest product for AT&T, as I explained three years ago after AT&T workers spent hours at my house trying to make my $16-a-month landline work without static. At the time, I noted it was costing wireline providers about $52 a year to support each landline, which had risen as the number of lines decreased. And as Craig Moffett, an analyst at Bernstein Research, notes in a presentation given Wednesday at a D.C. policy conference, that roughly 15 percent drop in access lines coincides with a 15-20 percent increase in costs of servicing lines for AT&T, while for Verizon a 15-percent drop in access line customers has led to a roughly 20- to 25-percent increase in costs of servicing wirelines. 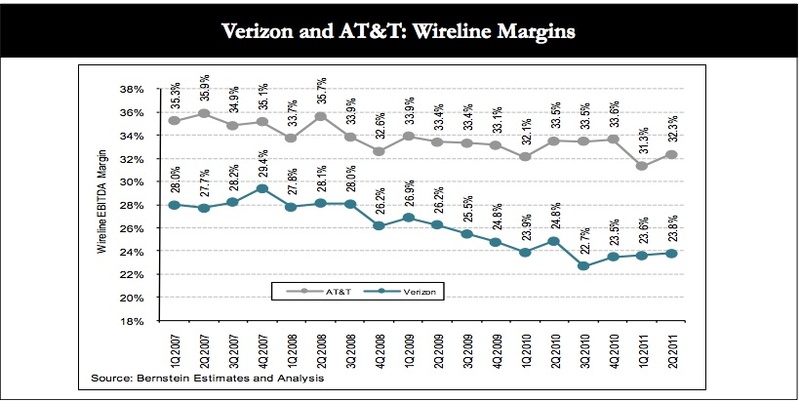 Below is his chart showing the decline in wireline margins for AT&T and Verizon. For a declining business, margins of 32 percent are sweet, and may reflect AT&T’s dogged commitment to raising prices, especially when compared to Verizon’s (s vz) faster margin erosion as Verizon sells off more of its wireline business and focuses on FiOS and mobile services. AT&T’s hikes in California follow price hikes in August for landline subscribers who don’t use long distance on their phones. Users face a $2 minimum usage fee now, which on my old landline bill resulted in the $2 fee and an additional $6 in taxes. As Lazarus points out in his column, part of the rationale for the price increase could be to push basic wireline rates closer to the cost of buying a package of services such as voice and Internet, which tends to have both generate more revenue per customer as well as reduce churn. But it’s also clearly AT&T’s response to keeping its wireline profits up even as the business costs it more to support. The bottom line for consumers is that for many, wireline just isn’t worth it. I just got off the phone with AT&T. I keep an emergency landline with very restricted usage. It was costing me $20/month. This month’s bill was $5 extra, so I called and asked why. The rep said they increased their fees. I asked why there was a $1.50 addition/change fee. She didn’t know. Her supervisor told her it was because of the price change. I told her to tell her supervisor this is B.S. I received no notification of these changes, and the rep didn’t even understand what the charges were for. Her supervisor probably won’t even do anything. Then, at the end of the call, the rep stated her scripted close: “AT&T values you as a customer.” Horse hockey. This is EXACTLY the reason I dropped comcast a couple of years ago. Wireline is a “cash cow” business that ATT, Verizon and others are “milking” to build entertainment and wireless networks. Digital networks, local fiber distribution plant to neighborhoods, outsourcing labor and management has increased, not decreased cash flow over the last 5 years. As to usage based pricing: Over 80+% of the cost of providing wireline service is fixed and has nothing to do with usage. I was at the conference where Moffet showed this chart. It was an overall analysis of profits vs. capital costs. His main point is that telco profits aren’t high enough to repay capital costs. Your comment about “margins of 32 percent are sweet” has to be taken in that context, which makes it much less sweet. How does fifteen years to pay back your loans sound to you? Okay, but how many phone providers are raising capital to build out copper networks. That’s a capex cost and issue, wheras most of the copper spending right now is opex. Thus, Moffett’s charts are mildly misleading, unless AT&T is taking out short-term loans to fix problems on their wireline network. There are a lot of people like me who do not want a cell phone and the gps tracking device. I’m not a protected species with an ear tag. I use a landline and dsl service. I will not be pressured into a cell phone and ridiculous fee for data. The fact is in my area (Ohio) Ameritech, which became SBC, which then became AT&T has neglected the phone lines for decades. The phone bundle running down my street is at least 30 years old and in need of replacement. SBC measured to replace the lines, then bought AT&T and forgot about it. The problem isn’t cost, it’s the fact that AT&T wants to dominate telecommunications again. They would rather buy someone else’s customers than maintain equipment and provide promised service. They neglect repairs and maintenance, cut staff, and service suffers. As a result they lose customers. Then they use the customer loss to justify more cuts. You can bet the execs got big bonuses for these decisions. Make them pay to fix the lines. Bad enough! Also in Ohio, I just got hit with a 10 percent increase in wireline Federal fees (for the needy?). This article, while informative, is riddled with errors: grammar, punctuation, etc. Did u even read over what u wrote before posting this? How much time did you save by omitting “yo” twice, Grammarian?